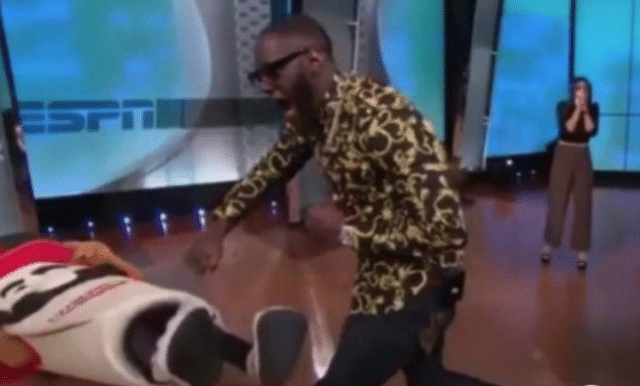 Deontay Wilder Bronze Bomber Heavyweight World Boxing Champion breaks ESPN Nacion mascot jaw with sucker punch on live TV. It was suppose to only be a playful tap, but that didn’t mean one heavyweight world champion could be compelled to rein it in as he sucker punched an ESPN sports mascot on live TV- breaking the man’s jaw. Following the incident which presumably even astonished Heavyweight World Boxing Champion- the Bronze Bomber, otherwise known as Deontay Wilder, 32 – the sporting hero apologized. Sort of. ‘I’m sorry’ the man later said- without adding anything further. The Bronze Bomber was on ESPN’s Spanish-language show ‘Nacion’ two weeks ago when he squared off against the program’s mustachioed, sombrero-wearing mascot as a stunt to promote his upcoming fight against Tyson Fury. Perhaps as a course of reflexes, aggression or the rhetoric of a seasoned pro unable to resist, Wilder walloped his ‘make believe’ opponent so hard that said ‘enemy’ was observed falling flat on his back. With rumors that the Spanish mascot’s jaw broken. Wilder took to Twitter saying he was sorry he injured the man ‘if this is true’ while also offering him tickets to his upcoming bout. ‘I sincerely apologize to the brave man that was injured (if this is true). I have the up most [sic] high respect for him, his participation, willingness and courage. If this is true, I personally would like to invite him to my Dec. 1 fight. Word is Bond’ the heavyweight tweeted. It was rumored that Wilder broke the mascot’s jaw, but fight promoter Showtime Boxing denied the man was seriously injured, according to Sports Bible. ESPN has declined to publicly comment on the incident.